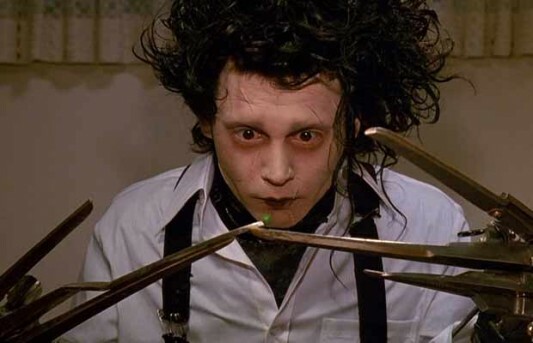 It has been almost twenty-five years since Tim Burton‘s imaginative fable Edward Scissorhands enchanted audiences around the world with its haunting visuals, dark humor, and a performance by Johnny Depp in the title role that to this day continues to be ranked among the superstar’s finest. Later this fall, 20th Century Fox Home Entertainment will re-release Scissorhands on Blu-ray to mark the occasion of its silver anniversary. The first time the film was released in the format, it received a disappointing transfer and a few modest bonus features (including a director’s commentary), but the commemorative set Fox has assembled will undergo a much-needed restoration and most likely be upgraded in the supplements department. It will also come packaged with some collectible goodies inspired by the film. The new Blu-ray will be available for pre-order at this year’s San Diego Comic-Con and those attendees of the convention who take the plunge will also be able to get their hands on an exclusive limited-edition lithograph created by artist Mark Englert in collaboration with Gallery 1988. You can check out both the Blu-ray package art and the lithograph, provided by Entertainment Weekly, here below. Each and every week, I, “Freddy’s Revenge!” Henchman 21 and “Jason Lives!” Empress Eve read a lot of comics. Seriously you guys, a lot of comics. Maybe too many comics. I mean, it is possible… theoretically. Naturally, we look forward to some more than others. I mean, who doesn’t? So, let’s take a look into the depths of our pull lists, grab some comics, and we’ll let YOU know what the top books to look forward to are for the week of October 22, 2014. Single issues and trades, they’re all here. Too busy making last minute additions to the haunted house to write a proper intro. Also, it’s kind of a slow week. Here’s what we like this week in the world of comics. Now don’t distract me while I peel some grapes to simulate eye balls and just read The GoD List! Today, TeeFury is doing one of their special “Twofury” deals with two themed shirts for $11 each. One is a Monty Python: Life Of Brian-themed shirt by NikHolmes called “WWBD?” (at left in royal blue); the other is an Edward Scissorhands-themed shirt by jimiyo called “Edward’s Topiary and Salon” (at right in gray). The sale began at Teefury today, Thursday, March 28, 2013, at midnight EST, and will continue for 24 hours from then, and once it’s over, it will not be sold on the site anymore. 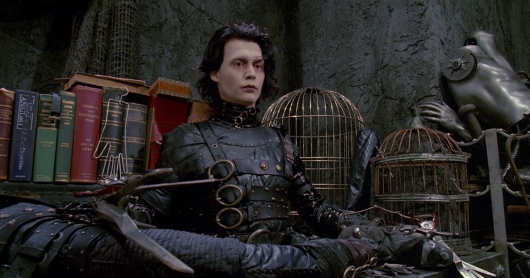 It’s been over two decades since Johnny Depp played Edward Scissorhands in the beloved Tim Burton movie of the same name. The actor has gone on to become one of the biggest stars on the planet, but recently decided to play the character again, and in the most unexpected of places. Depp was asked to get back into his 22-year-old character to voice a cutaway joke on the Fox animated series, Family Guy. As it turns out, the actor is a fan of the show and was happy to oblige. 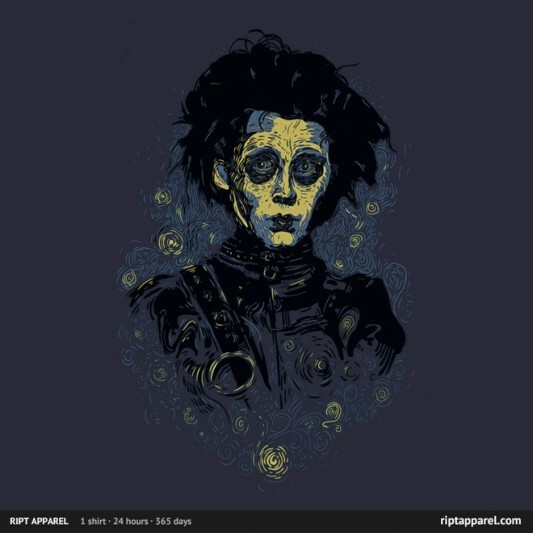 The $10 t-shirt deal of the day over at RIPT Apparel today is the Edward Scissorhands-themed shirt with a nod to Van Gogh’s “Starry Night” painting called “Scarry Night” by FrederickJay. The shirt went on sale at RIPT today, Saturday, July 7, 2012, at midnight CST, and will continue for 24 hours from then, and once it’s over, it will not be sold on the site anymore.